Smart voters follow the money. And we’re now seeing a flood of campaign cash flow into the campaign coffers of Lori Lightfoot from school privatizers and the wealthy elites who supported Rahm and austerity hawk Bill Daley. These are the very people who want to continue the status quo: policies that hurt our students’ families, undercut our schools, freeze our pay, gut our benefits and privatize public education. Lightfoot claims to be “progressive,” but that doesn’t pass the smell test if she’s taking huge contributions from the very people who’ve bankrolled the attacks on our public schools, our livelihoods and our dignity for the last eight years. Lightfoot should follow her own advice and give back every penny she’s received from every one of these public education predators. Tell her to do just that on her Twitter feed—and share the word about her double-talk. And Lightfoot’s contributions from Rahm allies and corporate insiders are growing. On Wednesday, Lightfoot took over $100,000 from big bucks Rahm financier Paul Finnegan, who also gave half a million bucks to school privatizer Stand for Children. Finnnegan also gave $300,000 to austerity hawk Bill Daley, who wanted to kill Local School Councils and preserve the unelected Chicago Board of Education. Finnegan gave Rahm at least $750,000 in campaign contributions overall. Earlier this month, Lightfoot received $100,000 from Madison Dearborn boss John Canning, who. along with Finnegan, put hundreds of thousands of dollars into Rahm’s campaign coffers last year alone. 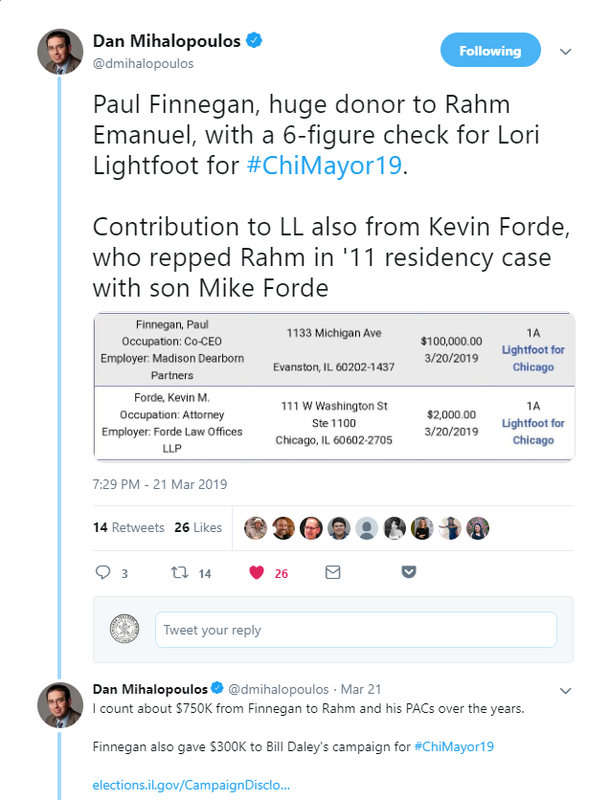 Rahm loyalist and Chicago airport contractor Rich Melman has also donated to Lightfoot, as has Rahm’s corporation counsel Steve Patton—who cheered on Emanuel labor lawyer Jim Franczek in court when we fought to prevent the mayor’s disastrous 2013 mass school closings. 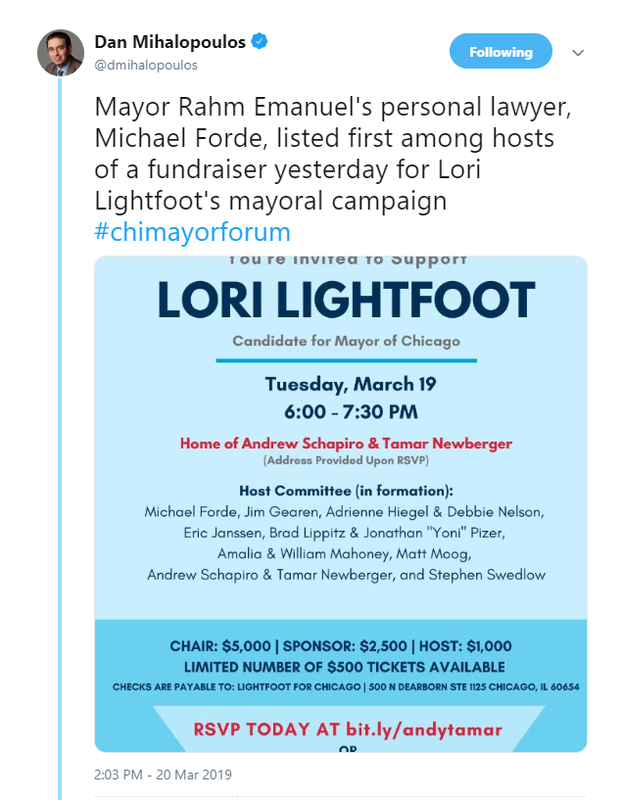 Even Rahm’s personal attorney, Michael Forde, the lawyer in the mayor’s infamous residency case and legal eagle in the effort to keep his emails secret, has forked over dough to Lightfoot and headed up a marquee fundraiser for her. No progressive politician collects cash from these kinds of political players. We’re currently bargaining with CPS and seven of its charter operators for contracts that provide the resources to fund the schools our students deserve. Toni Preckwinkle has embraced our agenda—from progressive revenue sources that fund our schools to her opposition to charter expansion and school privatization. Lightfoot’s education platform, on the other hand, is completely silent on charters, and she opposes reinstating the corporate head tax that Rahm killed as a favor to his big business pals, just like he killed half a dozen mental health clinics, over 50 public schools and the city’s environmental department. Instead of reinvesting in the schools Rahm closed over passionate objections from parents, students and residents, Lightfoot has proposed turning some into police training facilities. That scheme defies what those neighborhoods desperately need: civic anchors that connect residents with living wage work, job training, affordable housing, youth support programs and health services (including mental health services). It’s a slap in the face to our students and their families, who are being pushed out of our city in growing numbers. 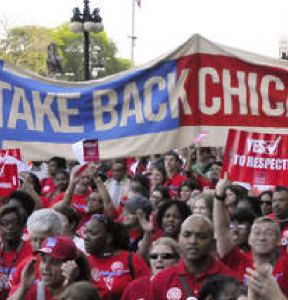 Who our mayor is makes a huge difference at the bargaining table, where CPS wants to lowball pay and ignore critical staff shortages for our hardworking PSRPs, ignore key demands for educational programs and services in our schools, increase principal control, and roll back key CTU wins for better learning conditions. We’re demanding instead that CPS increase our pay and benefits, boost staffing to adequate levels, cut class sizes in crowded schools, improve working conditions and enforce social demands that support our students, their families and the neighborhoods in which they live. All of those demands are jeopardized by a Lightfoot win. 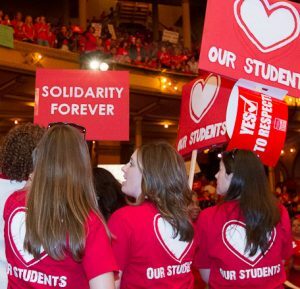 We helped inspire the national #RedForEd movement—and we know that when we fight, we win. That means taking a stand and fighting for the best candidate for mayor. And that person is not Lori Lightfoot.